If a pregnant woman contracts rubella, especially during the first trimester, the virus can damage the developing offspring. The location and extent of the resulting congenital anomaly are determined in large part by the developmental stage of the embryo at the time of the attack. Congenital heart defects, cataracts, mental retardation, and deafness are some of the more common defects resulting from maternal rubella. Treatment and Prevention. Except for complications that may result if the disease is contracted during pregnancy, other complications are rare. No special treatment, medicine, or diet is necessary unless the patient has a high fever. One attack usually gives lifetime immunity to the disease, although a second attack does occasionally occur. The Centers for Disease Control and Prevention recommends two doses of rubella vaccine for all children, given as combination measles-mumps-rubella vaccine, with doses at least four weeks apart. The first dose should be given when the child is 12 months old. Vaccine is also recommended for susceptible nonpregnant adolescents and adults who do not have rubella immunity. Congenital rubella syndrome is marked by a triad that includes microcephaly, microphthalmia, and congenital heart disease. From Damjanov, 2000.
congenital rubella syndrome (rubella syndrome) transplacental infection of the fetus with rubella usually in the first trimester of pregnancy, as a consequence of maternal infection (which may or may not be clinically apparent), resulting in various developmental abnormalities in the newborn infant. 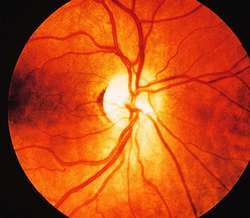 They include cardiac and ocular lesions, deafness, microcephaly, mental retardation, and generalized growth retardation, which may be associated with acute self-limited conditions such as thrombocytopenic purpura, anemia, hepatitis, encephalitis, and radiolucencies of long bones. Infected infants may shed the virus to all contacts for extended periods of time. 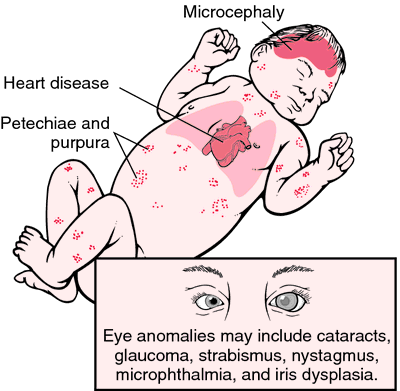 fetal infection with rubella virus during the first trimester of pregnancy resulting in a series of congenital abnormalities including heart disease, deafness, and blindness. a collection of birth defects caused by transmission of the rubella virus from an infected mother to a fetus during the first trimester of pregnancy. Anomalies include cataracts, congenital heart disease, and sensorineural hearing loss. The infant may be small for gestational age and exhibit hyperbilirubinemia, thrombocytopenia, and hepatomegaly. A malformation complex in a fetus infected in utero with rubella; the defects reflect the embryologic stage at the time of infection, with developmental arrest affecting all 3 embryonal layers, inhibiting mitosis, causing delayed and defective organogenesis; maternal infection in the 1st 8 wks of pregnancy causes embryopathy in 50-70% of fetuses; the susceptible period extends to ±20th wk; infection in late pregnancy carries little fetal morbidity Clinical Cardiac defects–eg PDA, pulmonary valve stenosis, VSD, hepatosplenomegaly, interstitial pneumonia, LBW, congenital cataracts, deafness, microcephaly, petechia, purpura, CNS Sx–eg, mental retardation, lethargy, irritability, dystonia, bulging fontanelles, ataxia Lab Viral isolation, IgM antibodies in fetus by hemagglutination inhibition Vaccination Attenuated live virus vaccine between 15 months and puberty; effective antibodies develop after immunization in 95% of Pts. See Extended rubella syndrome. Global progress in rubella and congenital rubella syndrome (CRS) control and elimination--World Health Organization (WHO) Regions, 2000, 2012, and 2016 WHO region (No. A systematic review of rubella vaccination strategies implemented in the Americas: impact on the incidence and seroprevalence rates of rubella and congenital rubella syndrome. Late ocular complications in congenital rubella syndrome. Similarly, another study found that 62% of women who gave birth to infants with congenital rubella syndrome had at least 1 missed opportunity for immunization prior to that pregnancy. November 1980) Handicapping Conditions Associated with the Congenital Rubella Syndrome, American Annals of the Deaf, 125, 8. Laboratory confirmation of suspected cases of measles, rubella, and congenital rubella syndrome is an essential component of surveillance for these diseases. To estimate the number of congenital rubella syndrome cases for 2005, the methodology described by Cutts and Vynnycky (8) was used to first estimate the incidence (force) of rubella infection assuming an age-dependent infection rate. The question addressed in this commentary is about the safety of rubella virus vaccine, particularly regarding viraemia, placental infection, trans-placental foetal infection and congenital rubella syndrome (CRS). To determine the proportion of postpartum women aged 15-49 in Peru who are susceptible to rubella, in order to help address strategies to eliminate rubella and to prevent congenital rubella syndrome (CRS) in the country. We announced several months ago that we have eliminated rubella and congenital rubella syndrome from the U. 5 million cases of rubella and 20,000 cases of congenital rubella syndrome, which caused thousands of fetal deaths and left scores more babies deaf, blind, and mentally challenged. In September 2003, the 44th Directing Council of the Pan American Health Organization adopted a goal to eliminate rubella and congenital rubella syndrome by 2010.